With the growing influence of digitalization in our daily lives, our computer systems possess massive amounts of data files that are important to us. 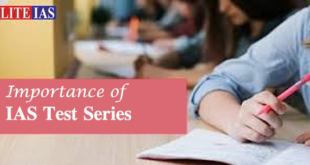 It is quite significant to systematically arrange these data files in our disk so as to retrieve them quickly as and when required. Depending upon the file formats such as pictures, music, documents, etc., we sort our data into different folders or rather partitions. At times many of these partitions become full, and we feel an urge to resize them. We may even want to resize all existing partitions to make way for new partitions. So what to do when you want to reorganize the part or entire drive structure on your physical disk? 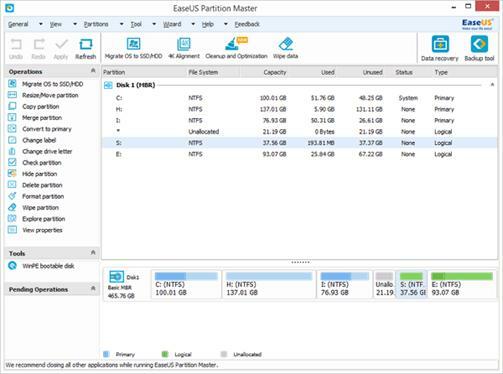 Although the Window’s default partitioning tool is capable of creating, resizing, deleting partitions, the EaseUS’s partition manager offers simple and interactive user interface that aims to create, resize, merge, delete, copy partitions on the disk. You can expand or reduce the size of partitions on the disk using Partition magic. a) Download and Install partition magic. b) Launch the partition manager. The home screen will display all the partitions along with their details. c) Suppose we want to increase the size of the C drive. So, select the partition behind C drive and select the Resize/Move option by right clicking on it. A new window will open stating all the details of the selected partition. d) You will locate a pointer on the window. Using your mouse’s pointer, drag the pointer from left partition handle so that the partition’s size gets shrunk. Then, Click OK. This will add some unallocated space on the disk. e) Now choose the C drive and right click on it followed by selecting the Resize/Move option. f) Using the mouse pointer, drag the right partition handle to increase the size of the C drive as desired. Then, Click Apply. g) Also remember that if there is already some unallocated space behind C drive, you can straightway increase its size by selecting the Resize/Move option. c) Select the partition to decrease its size. Then, right-click on it and select the Resize/Move option. d) Now a window pops up which depicts the size of the partition. Using mouse pointer, drag the left partition handle towards the right to decrease the size of the partition. The new size of the partition can be seen in the box below. Click Ok and then, Click Apply to execute the shrink command. b) Select a partition you want to merge. Then, right-click on the partition and select Merge Partition option. c) A window will open showing all the partitions. Select 2 adjacent partitions you want to merge. d) Select a merge destination by choosing appropriate partition label from ‘merge selected partitions to’ drop down list. Click OK.
e) Click Apply. You can now see the partitions have merged into one big partition. 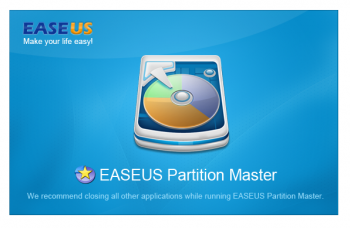 The EaseUS partition manager provides an important feature of copying your disk files to another destination. Basically, it is a cloning operation in which your entire applications as well files get copied onto another disk. So if your files on the primary disk get accidentally deleted, you can still get your files back easily on destination disks or other secure places. Perform following steps to copy disk contents using partition manager. a) Launch the Partition Magic tool. b) From the top menu, select Wizard. In the Wizard drop-down list, select Clone disk wizard > Copy disk. c) A new window will pop up showcasing your existing disks along with their details. d) Select the disk you want to copy. This will be your source disk. Click Next. e) Now choose the destination disk. This is the disk where all the contents of the source disk will be copied. Click Next. f) The Disk Clone Wizard will seek your permission to delete all partitions on the destination disk. Click Confirm to grant partition manager the necessary permissions. g) You can resize partitions on the destination disk using Resize/Move option of partition magic tool. Then, click Next. h) Now click on Finish Button to end Disk copy. You can preview the copy results on the left panel in ‘Pending Operations.’ Click Apply to execute copy operation. I hope that it is a helpful article to Resize, Merge, Copy Partitions using Partition Manager!